Over the last couple of days, Dustin and I have been toying around with this idea of buying an RV of some sort and living in it for the next couple years. We aren’t ready to buy a house right away, but I hate the idea of paying so much for rent each month for something that we can’t even call ours. I feel like I’m just throwing money away. Having to leave so suddenly after the investment we made in our little house in here in Louisiana is tough. I’m ready to just have something that I can call mine! So we’re having these grand visions of buying an RV and redecorating on the inside to make it our home. 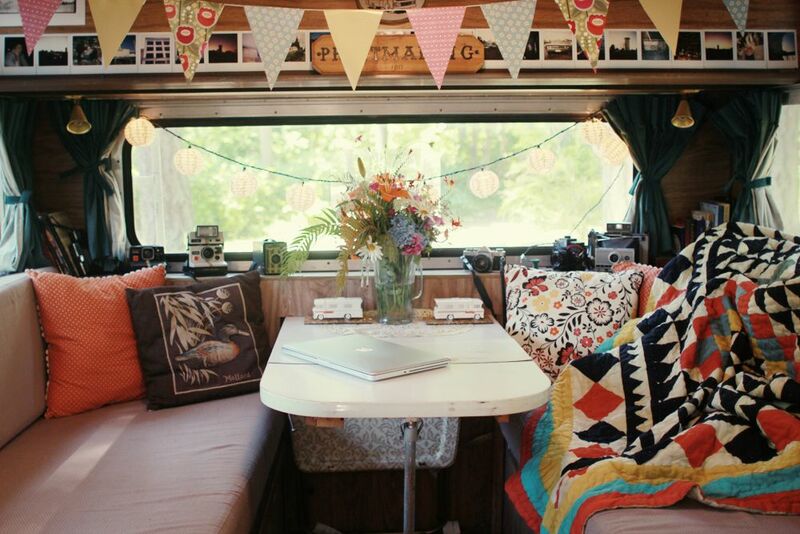 I originally got this idea from my friend Kim whose dream is to get a 1970’s era Airstream and travel across the country selling her cute crafty things at festivals and markets. She is queen when it comes to vintage/thrifty decorating, so of course, she has tons of cute ideas of how to utilize and decorate such a small space. We can either rent or buy some land in North Carolina. Heck, we could even just park it at one of those RV camps that have swimming pools and nice showers. We care more about the surroundings of our home than the interiors. I want to be able to walk out my door and be surrounded in the peace of nature. So much that I would be willing to live in less than 200 square feet. We’re at that the beginning of an adventure in our lives once again, and it is time for us to get creative and think about the kind of life we want to be living. I’m starting to wade in student loan debt, and I want to find a creative solution to keep from being swallowed. That’s why I’m starting to write more. That’s why we’re gardening and going vegetarian (quality meat is expensive! ). I think a lot of our generation is starting to do the same. We’re at our creative peaks in life, and it’s our turn to see what we can do with that energy. Long story short, I know that I will be happy no matter where I am. I’ve never been more at peace in my life than right now. I try to view everything as an opportunity to get creative and express myself. What do I want to do? What do I want to do? Another opportunity before us we’re thinking about is living on an organic farm. We’ll be meeting with a man who owns Goodlove’s Friendly Farm and has two homes that he rents out on the property. We would help take care of chickens and have a set plot of land that we can garden on. It’s about 40 minutes outside of Asheville, but we think the distance might be worth it. Dustin’s already mentioned it to Rebecca, and she was supportive. It’s absolutely beautiful out there. Beyond words. And it would be a great opportunity to get experience living a sustainable lifestyle. Our dream is to be able to grow most of our own food and become less reliable on all the junk that’s out there. We just want to be healthy, happy, and good to the earth. It’s exciting to examine all these new possibilities before us to find the one that make us feel fulfilled, a way for us to make our life our own and just be happy.